1. What are the different types of Printers? Answer: Daisy -wheel printer, dot-matrix printer, impact printer, ink jet printer, laser printer and line printer. Answer: Analysis of source program + Synthesis of target program. 5. Language processor consists of two phases. What are they? Answer: Analysis phase and Synthesis phase. 8. There are two fundamental approaches to parsing. What are they? Answer: Top down parsing and bottom up parsing. Answer: PL/I, C, Ada, C++ etc. 14. In compiler, which analyzer converts the source program into a sequence of atomic units called tokens? Answer: It is abbreviation for console. Answer: Computer Aided Drafting and Design. 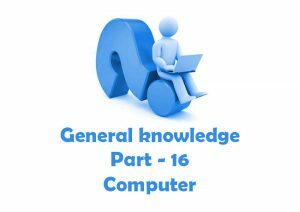 Answer: CISC Complex Instruction Set Computing. 23. RISC processors are 70 percent faster than which processors? Answer: IPX Internet Packet Exchange. Answer: LISP and APL BASIC was an interpreted language. 26. What are the popular programming languages for knowledge representation? Answer: LISP Prolog and Small talk. 27. In expert system, where we stores information about the particular domain? Answer: Bill Gates & Paul Allen.